Our brand La Ventilazione previews AIRCONTROL, the new ventilation grill with thermostatic valve for energy saving and automatic operation without electricity nor batteries. 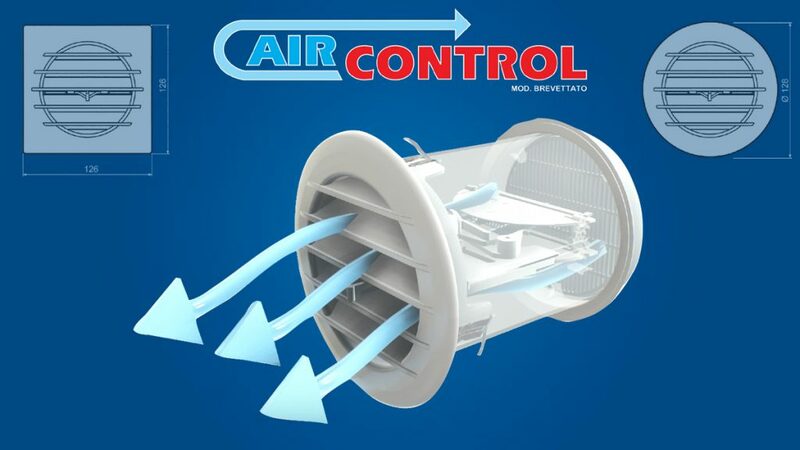 AIRCONTROL is a patented device designed to self-regulate the airflow based on variations in the outside temperature: the product is suitable for all applications where ventilation must be created (eliminating mold, odors, condensation, etc.) avoiding annoying drafts of cold air and guaranteeing good environmental conditions inside the building. An innovative technology allows three operation modes: automatic, manual always open, manual always closed. AIRCONTROL operates in AUTOMATIC mode in the temperature range from +5 ° C to +20 ° C (“mild climate” version) and from -5 ° C to + 10 ° C (“cold climate” version). The lower the outdoor temperature, the lower the incoming air flow until the device is completely closed. The higher the outdoor temperature, the greater the flow of incoming air, up to the maximum opening. The product is easy to install and it is suitable for ventilation holes with a diameter from 100 to 110 mm; it is available both with round or square front grill.